Khalifa University of Science and Technology, a research university dedicated to the advancement of learning through the discovery and application of knowledge, and the Korea Advanced Institute of Science and Technology (KAIST) today announced the launch of the Khalifa University- KAIST Joint Research Center in Abu Dhabi to focus on key topics of the Fourth Industrial Revolution. The launch event at the Khalifa University Main Campus was attended by officials from both the institutions including Dr Sung-Chul Shin, president of KAIST; Dr Arif Sultan Al Hammadi, executive vice-president, Khalifa University; Dr Steve Griffiths, senior vice-president, research and development, Khalifa University; and Dr Man-Sung Yim, dean, KU-KAIST Institute. In addition, government leaders from both countries were present on the occasion. 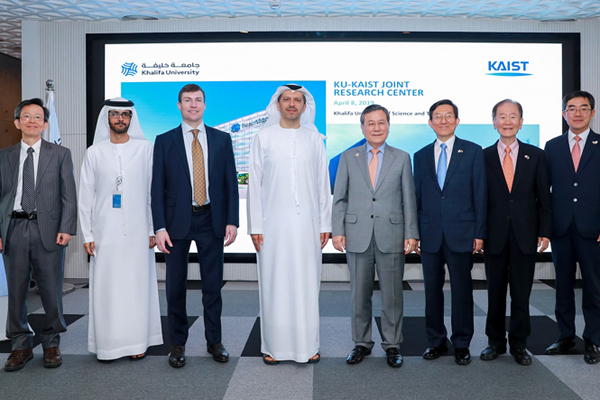 The Khalifa University-KAIST Joint Research Center will focus on ‘Smart Transportation’ that will cover autonomous vehicles, infrastructure for autonomous vehicle operation, wireless charging for electric vehicles, and infrastructure for electric autonomous vehicles. The centre will also focus on ‘Smart Healthcare’, covering healthcare robotics as well as sensor and wearable devices for personal healthcare. The centre will be co-directed by Dr Daniel Choi, associate professor of mechanical engineering at Khalifa University, and Dr Jong Hyun Kim, professor of Dept of Nuclear Quantum Engineering.